Summary: Sena Kobayakawa is a runty, push-over freshman drafted into his high-school’s American Football Club. After becoming a school celebrity thanks to his amazing speed, he takes on the mantle of Eyeshield 21 to hide his identity — not knowing that he’s not the first Eyeshield 21 or just how difficult, dangerous, and amazing American football really is. Why you should read it: It makes football accessible to people who wouldn’t normally be into it (like many anime/manga enthusiasts), has amazing illustrations, and develops group of characters you’ll remember long after you’re finished. “I don’t know anything about football,” I told my poker buddy, Daniel Lu. “I don’t even really like it as a sport.” I’d go to a game. I could watch it on TV. But as soon as someone started in on stats and player histories and yelling for any reason, I’d check out. So, I read it. And I’ve read it front-to-back twice since. And it’s a story I come back to every couple of years, with characters that I miss and an exciting narrative arc that is both about/not about football. Written by Riichiro Inagaki (who served as a judge for the Tezuka Award with Akira Toriyama of Dragonball/Dragon Quest fame and Eiichiro Oda, known as the creator of One Piece) and illustrated by Yusuke Murata (who is currently illustrating the sardonic and fantastic One-Punch Man), Eyeshield 21 is the story of high-school freshman Sena Kobayakawa. A runt all his life, Sena was constantly picked on and, since he was always running from bullies, he inadvertently developed amazing speed. Spotted running by the American football club’s captain, he’s drafted on the spot—to a team of two members (American-style football isn’t exactly huge as a sport in Japan). The story begins with Sena and his two new friends cobbling together enough members to make a full team, each with unique abilities making them perfect for their roles as linemen, receivers, and kickers. The goal? The Japanese American football championship. At least, until they’re ready to take on nationals, and eventually the world. So, why do I read this every couple of years? I developed an appreciation for football reading Eyeshield because of the way it’s integrated into the story. Like most manga, where the main character develops a technique and further refines it throughout the series (Goku going Super Saiyan, Naruto’s Rasengan, etc. ), Sena develops his ability to run. However, the manga constantly refers to actual football techniques that he gains from coaching or watching other players. Sena learns how to properly cut and pivot, the defensive linemen learn how to bump, the receiver learns how to make a backwards catch, and so on. Also, famous football plays are also integrated into the team strategy. What gives the techniques a cartoonish edge is how each is given a title. A running cross-over step (used to change direction without losing speed) is called the Devil Bat Ghost, and the illustration surrounding each technique creates a visual metaphor for the purpose the technique serves. Also, each team that’s encountered in the America Football league sticks to a theme based on their name. One team that’s based on Knights (Teikoku High School’s Alexanders) has a running back whose one-armed tackles are depicted as spears. Another team with a western theme (Seibu High School’s Wild Gunmans [sic]) has a quarterback whose throws are so fast his arm is compared to a pistol. All of this adds a great cartoonish element to football that not only makes it exciting for those who aren’t fans of the sport, but also gives a lot of opportunity for amazing illustrations, all of which are taken advantage of by the dramatic shots drawn by Yusuke Murata. You’re aware of every character’s motivations and every character has a goal. 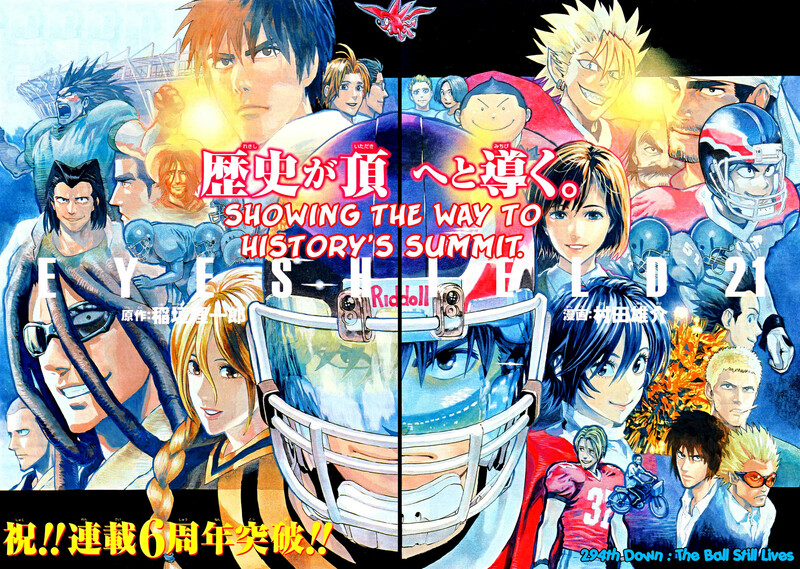 Considering the roster for Eyeshield 21 has over 40 characters, this is a monumental feat of writing and gives the story depth no matter who the story centres on in a particular chapter. And the team dynamic is second to none. Since each character has a full personality, you have a sense of what they would act like. It makes the victories more exciting, the losses more heartfelt, and the jokes all the funnier. It’s so much fun to watch characters bounce off one another in ways that you wouldn’t expect. There’s also the way the story develops tension between the schools. The Devil-Bats (the name of Sena’s high-school team) lose to a team and end up coming back to beat them. Hated, irredeemable enemies become teammates—some of the best chapters are where former nemeses join with the Devil-Bats; these characters that were once such a threat to the team are now a menace to newer, stronger opponents. Admittedly, the character roster is light on female characters and the ones that take part are given roles such as the clubhouse cleaner and cheerleader. However, their personalities more than make up for their light roles and they’re treated as serious characters. In the end, Eyeshield 21 is a visual and storytelling triumph. Its characters are as detailed as the action scenes and every moment feels like you’re in the stands. And as someone who never understood the excitement of high school football, the Deimon High Devil Bats gave me a good idea of what I was missing.